If you want a low maintenance exterior siding for your house that is available in dozens of distinct styles and vibrant colors, then you should consider the many benefits of vinyl siding. No longer just a plain vanilla siding choice for suburban homes, today you can find vinyl products installed on houses of all types and sizes. While traditional horizontal clapboards are still the most popular siding choice for many homeowners, you can now purchase vinyl panels that accurately replicate the look of wood shingles, vertical board and batten siding, and even rustic log cabin siding or stone veneer. Horizontal vinyl clapboards are a traditional looking siding choice that mimics the appearance and texture of beveled wood siding. Many manufacturers, such as Certainteed, offer their vinyl clapboard panels in several different profiles and patterns, ranging from a 4-inch to an 8-inch wide clapboard with a smooth or textured surface. Depending on which product you choose, you can expect to pay between $80 and $220 per square of siding, which is enough to cover 100 square feet of wall space. Vinyl shakes and shingles are a low maintenance alternative to real wood shingles, which often require costly refinishing and replacing. Vinyl shingles can be used to side your entire house, or as a complementary accent to another style of siding. Vinyl shakes and rough textured shingles are an appropriate choice for cabins, cottages and other rustic styled homes, while straight-edged, smooth shingles may be a better choice for more contemporary looking homes. Costs for premium vinyl shingles and shakes can range between $300 and $600 per square. Vertical siding panels can replicate the look of wood board and batten siding, as well as bead-board paneling and tongue and grove wainscoting. Vertical panels are available with a textured surface, which can look like rough-sawn cedar, or with a smooth surface, which mimics the look of sanded wood boards. You can expect to pay between $180 and $350 per square for some premium brands of vertical siding. Vinyl log panels are available that can give your home the look and feel of a real log cabin. StyleCrest and Kaycan are two companies that offer the most realistic looking, and most readily available, vinyl log siding. This premium siding can cost between $320 and $420 per square, not including the needed trim pieces and corner boards. Most styles of vinyl siding are installed with specialized trim pieces to finish around windows and doors and at the home's corners and soffits, so remember to budget for them, too. When selecting a vinyl siding for your house, you should choose a siding that complements both the architectural style of your home, as well as the surrounding neighborhood and natural environment. Vinyl siding manufacturers offer dozens of colors for you to choose from, ranging from earth-toned reds and tans to more traditional looking whites and greys. When possible, examine an actual siding sample before making your final style and color selection. Some vinyl panels are manufactured with a backing of solid foam insulation, which helps increase the durability of the siding and adds to the product's insulating R-value. Other types of non-insulated vinyl panels can be installed on top of sheets of solid insulation, which creates a flat installation surface and can improve the overall energy efficiency of a home. Many homeowners choose to hire a siding contractor when installing new siding on their house. 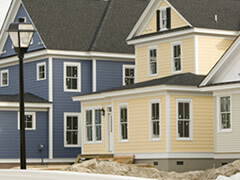 Vinyl siding must be installed correctly so that it performs as designed and is warrantied by the manufacturer. You can use the form on this page to get started and consult a local siding contractor in your area to review siding options and installation costs for your specific project.